This is a set of global mods that change a few things about jobs. Some of this stuff may have been done before, like uni jobs in Inteen, as I've heard. But I love job related mods and couldn't help making them. Some of them still may be useful. Pick and choose. Separate packages should make it easier. 17 Feb. 2018: YA-work-wants-fears updated with new lifted want restrictions (enter career track). If you have been testing these mods earlier, please remove testing package before adding any of these. I think, it's called "job-options-lamare.package". Adults, young adults and elders can choose between part-time and full-time jobs. A dialog pops up when your sim is about to use computer or paper to find a job. Teens are still limited to part-time jobs. Debug interaction on a newspaper provides choice as well (by Shift-click with cheats enabled). Young adults, adults and elders see both part-time and full-time menu options. 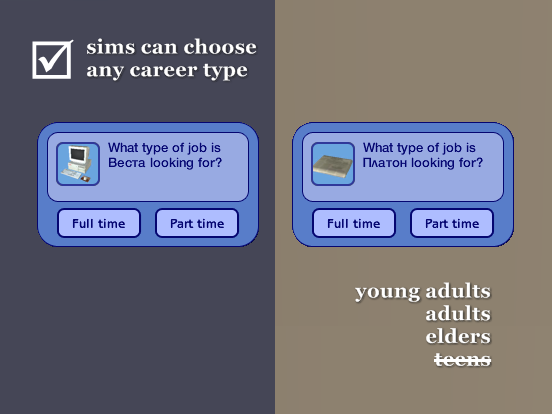 Sims, including teens, can choose between part-time and full-time jobs. A dialog pops up when your sim is about to use computer or paper to find a job. Debug interaction on a newspaper provides choice as well (Shift-click with cheats enabled). Teens, young adults, adults and elders see both part-time and full-time menu options. Normal job-seeking interaction is not modded at all. Debug interaction on a newspaper (Shift-click with cheats enabled) provides both part-time and full-time options for teens, young adults, adults and elders. Tested on UC (AL/M&G game version). If your latest EP is Pets or later, it might work for you too (test in testing 'hood first just in case). CheatOnly version might work on even lower game versions, but I can't test and confirm. All versions should be compatible with Pescado's Harder jobs and Cyjon's Job Stopinator. CheatOnly version shouldn't conflict with InTeen. Other versions probably do. Promotions are mostly offered instead of being pushed on sims and pets. A dialog pops up for player to accept or decline new position. By default, the chance of getting it is 100%, provided sims qualify for the next level, but it can be altered with lower promotion chance mod. When a random boss's cousin promises promotion (networking bonus), after the next work day, sims are presented with an offer. When a colleague pulls some strings (good relationships or love? ), sims get an offer. Sims have a 40% chance of getting second offer, after they decline the first one, provided they qualify and have good job performance. Better promotion deal takes sims to even higher position (skip level), but never to the top. promotions caused by chance cards. This mod applies to full-time, part-time and pet career tracks. Should be compatible with Pescado's Harder jobs and Cyjon's Job Stopinator. May conflict with Pescado's jobfixes. Looks like it's for OFB jobs. Haven't played them much, so don't know what is wrong with them and what jobfixes fix. Sims and pets can work while being in university 'hood. Sims from teen to elder, including young adults, can find a job on computer and newspaper. Sims can find a job for their cats and dogs living with them on campus. The game processes jobs properly on University lots (for example, checks for being late) and shows you job-related notifications. Working sims and/or pets get carpool to work. Note: If you get "no more offers" message, try again and you'll get job offers. It may happen when you've just installed the mod or just moved in (some stuff needs time/nudge to update). Young adults can have wishes and fears about work: find a job, go to work, get a promotion, etc. Requires any EP from Nightlife or higher (but I only tested on UC). The Sims 2 team, SimPE team, MTS & Wiki, and also lientebollemeis and LilSister for testing and feedback.